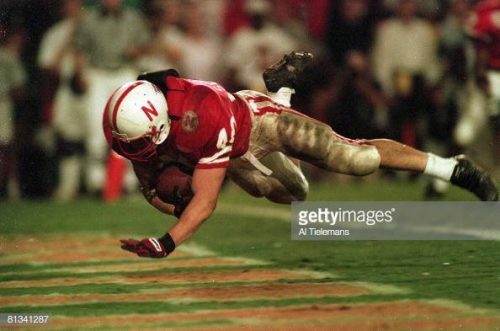 When most folks hear the name ‘Cory Schlesinger’ they recall the vision of a muscled, dirtied and grass-stained number 40 tumbling for six points into a Miami end zone on his way to snuffing out the last vestiges of Hurricane pride. Question: So, you’re living in Michigan now? How’s that treating you? 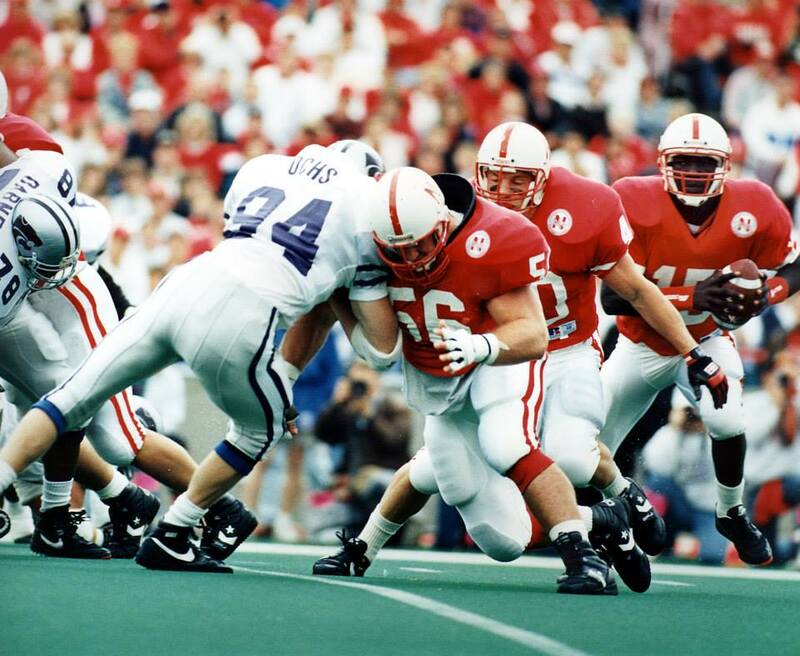 Cory Schlesinger: We lived there, but I always came back to Nebraska to train. When I was playing for Detroit it was always six months there and six months here. We were living there and then I got my teaching job, so it’s kind of nice to have my summers off, I guess, get some things done around the house and not going to the club since I’m not playing so much anymore. Q: I spoke with Bryan Bailey last night and he misses seeing you and training you. Q: A skinny, little redheaded guy in Lincoln, Nebraska, huh? CS: That’s right! (laughs) He’s so hard to get a hold of. And the USC guys that I played with, who got drafted by the Lions? They would go, “He’s the best strength coach we’ve ever had.” And I’d go ‘Obviously!’ Mr. Steve Pederson, the idiot, I don’t know why in the world they would ever get rid of Bryan. Q: Lord only knows, Cory. Lord only knows. So you’re from a little town outside of Columbus, right? CS: Duncan, Nebraska. When I was there it was 410 people. Now it’s probably 365. It’s 8 miles from Columbus. They used to have an elementary school there, and I went to junior high and high school in Columbus. They recently closed the elementary school, too, so now everybody‘s gonna leave there. Q: In addition to football, you were a pretty decent wrestler, weren’t you? CS: Yeah, not too bad. I was a two-time state champion at 189 lbs. and I weighed about 185. (laughs) It was good because I never had to diet my last two years. (Though I wouldn’t eat in front of my other wrestling teammates who were dieting; I tried to watch myself a little bit.) I had to diet my sophomore year and that was not fun at all. Q: I talked to Clinton Childs a few weeks ago. Did you ever wrestle Clinton? Q: Clinton was pretty good in his own right, wasn’t he? CS: Yeah, I think he got to the finals his senior year but he got beat by another Columbus guy. Q: That was your freshman year at Nebraska, right? CS: Yeah, and for me it was a little bit different coming in, because it was the last year for Freshman Football. So we kind of had our own coaching staff and players, where we were in the north locker room all kind of by ourselves. They had the varsity and everybody else on the other side of the stadium in the south locker room, so we kind of had our own little group of trainers and everything. It was kind of like an all-star football team on that side because we were the best of the high school guys, and some guys from the other states there that were some scholarships, a lot of walk-ons. Our own little group. That was some really good times. I’m glad I had the opportunity to play freshman football. It was kind of the beginning of your career, because you kind of knew the next year you were gonna redshirt. And going out playing on Friday afternoons was a blast; playing those little junior colleges, schools from Iowa and Air Force, too. I can’t think of some of the other schools. Iowa Snow? I don’t even know what the other teams were, but it was a lot of fun playing on Friday afternoons. Q: Now, do you think you freshmen being there together in the north stadium, do you think that developed some cohesiveness that would not otherwise have occurred had you been thrown in with the varsity right away? CS: Well, when I first started there were so many players. There were eleven fullbacks, I remember. I counted them: Eleven fullbacks. Eleven for one position! 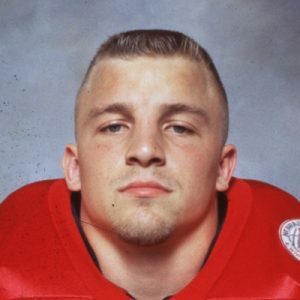 I remember thinking, ‘How in the world am I going to get up there and start playing?’ Then I realized after I played with the guys and watched them compared to what I was doing out there, I figured, ‘Okay, I’ll weed through them pretty fast.’ I was the starter for the freshman football team and did pretty well, I guess. Then after freshman season was done I got an opportunity to go up and practice and run cards against the varsity with the scout team, which was a lot of fun, too. It was November and getting cold out, and I’m doing the run drill and doing isolation blocks on Mike Petko and Pat Tyrance. I remember those guys. Hitting those guys, they would literally pick me up off the ground. Especially if you had the ball, they would pick you up. It was just amazing. You asked what I remember when I first got started, that’s the one thing I remember, those guys hitting you, but you’d literally come off the ground and be, ‘Geez, I can hardly imagine what it’s gonna be like playing football with those guys,’ you know? 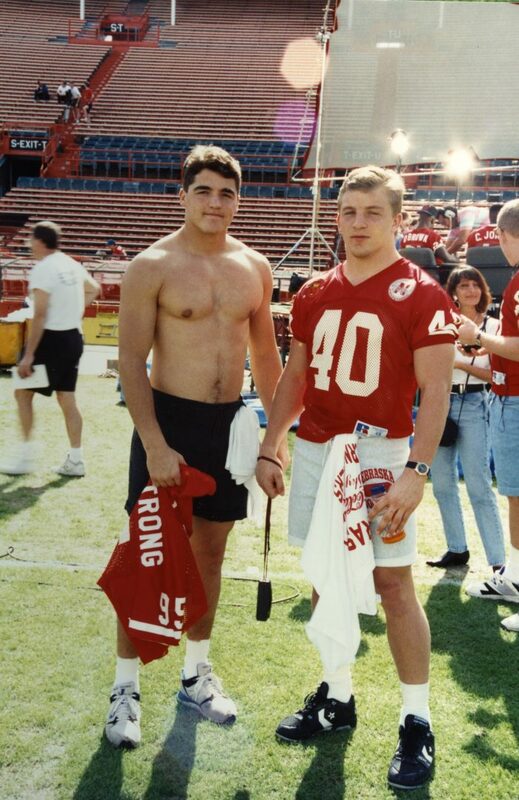 But I got a lot of respect from those varsity guys because I’d go after them: ‘I’m not gonna slow down, I’m still gonna try to hit you.’ I know I hurt Mike Petko’s shoulder before the bowl game. He had to put his arm in a sling for that game and maybe had surgery after that, but I’m pretty sure it was me that did it. (laughs) Those were good times there. Q: So obviously, practicing with the big boys provided you your first experiences with Coach Solich. Any comments on that? CS: We really didn’t work a lot with him yet, because we would kind of go down and do our scout team stuff, we’d help with the cards and stuff. I remember sitting in the meetings a lot with Coach Solich, and even my redshirt year, you did a lot of bag work and held bags and stuff like that. We were kind of like pretending we were linebackers and things like that. He was coaching us, but he wasn’t really coaching us yet, because he was worried about his first stringers. And my running back coach was Turner Gill, actually, my freshman year. It was Turner Gill. Q: What sticks out about Turner from those days? CS: I remember his calves. (laughs) I don’t know why, but he had some big old calves. I just remember his personality. He was kind of like the rest of those coaches about precision and doing things right and “we’ll do it until we get it done right.” That’s one of the things that makes a winning organization, doing the little things and doing them right. CS: Exactly. The option. We had a whole option drill and that’s why no one could stop us in the option. We could run on the short side of the field and they could put all eleven guys over there and run at you and we’d still get yards on you. We were just masters of it. That’s because we did it so often, which was great for us. Q: Find one thing and decide you’re going to be the best in the world at it, right? CS: That’s right. And we were. Q: And I’d be remiss if I didn’t ask you, how many years did you block for Barry Sanders in Detroit? Q: I’m guessing it was a little different than your time at Nebraska because of all the moving around and improvising Barry did? CS: It was very difficult. (laughing) I mean, it was to the point where you were going to get your SAM linebacker and he’s hauling tail on the other side of the field and Barry is doing his own thing, he’s not going to follow you. On the other hand, Barry could make my bad block look great (laughs) because he could out-juke them when no one was blocking, let alone having a fullback in front of him putting a block on. It was, ‘What is this guy gonna do?’ I remember talking to other guys I played with who then played against him and they were, ”What can you do to prepare for Barry? There’s nothing you can do!” (laughs) Of course, it helps that we had three great receivers out there, so when they’d bring all eleven guys up we’d just dump it right over them to the receivers. It’s too bad we did not get to the Super Bowl with that team. I don’t know how we didn’t because we had a lot of weapons over there. Q: Did you guys have Scott Mitchell at quarterback then? Q: I tell you what, Cory, the most beautiful pass I’ve ever seen in Memorial Stadium was a 50-60 yard touchdown rainbow that he threw when he and the University of Utah came and visited us in the late ’80’s/early ’90’s. It was a thing of beauty. What a talented guy he was. But as far as blocking for Barry, was it coached to you that one should continuously block until the whistle blows? CS: Basically. It was taught to the linemen, too. You just go until the whistle blows, because Barry would run laterally. He probably ran fifty yards laterally and still had a twenty yard gain. And he really went about 79 yards on a play, but only got 10 yards, you know? That’s how he played. He was the only player that I’ve ever seen who could fill away stadiums. Some of these away stadiums, they were rarely packed, but when we came to town there would be a ton of Barry jerseys in the crowd and the place would be packed. That was the cool part. And also, everybody watched. You know, usually if the other team’s offense is out there, the defensive guys are on the sideline looking at photos or sitting on the bench, but when Barry would play the other team’s offense would be standing there on the sideline watching the game, too. Watching to see what he was gonna do. We all stood there and we’d watch him to see what he was gonna do. Everybody’s jaw would just drop every time, too. Q: Cory, did you guys ever talk about him wanting to play for Nebraska coming out of high school? CS: I can’t say that we ever did. No. I don’t think. I think he came for a visit to Nebraska, but was he from Oklahoma, anyway? Q: He was from Wichita, Kansas and he was a good friend of former Husker I-back Jeff Smith. 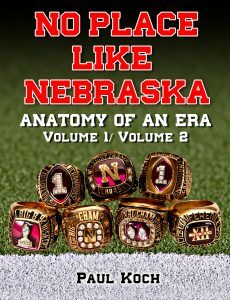 The story goes that Charlie McBride recruited him and Barry desperately wanted to be a Husker, but Coach Osborne said that we already had a small running back coming in that year, Johnny Rodgers’ son Terry, and that we didn’t want two small running backs in the same recruiting class. CS: (laughing) That was a big mistake. Q: I was there for the Oklahoma State game when Barry was a sophomore and he was lighting us up on special teams, and Charlie goes over to Coach Osborne on the sidelines and says, “Hey Tom, that’s the one we passed on.” And Coach Osborne says with a grimace, “Uh-huh, I see that.” (laughs) So, back on track here, tell me about your first year or two at Nebraska. What about the organization itself stood out? CS: One of the things I do remember about playing there, and I think why we were so good, was there were fights between the offensive linemen and defensive linemen. And it wasn’t fighting because they were mad at each other, it was fights because somebody wasn’t trying hard enough. And I remember going, ‘Wow, I’ve never seen a fight because they were, “You’re slacking! You’re not going hard enough!” ’ They pushed the other guy to get better, also, because it’s gonna help the whole team out. That was like the most amazing thing I ever saw. It was like, ‘Wow, I’ve never been yelled at by my own teammate for not playing hard enough during practice.’ It was definitely the reason we were better, was because of that reason. Those guys made each other accountable to play like they were going to play in the game on Saturday: ‘Practice like you were going to play.’ And that’s what we did, we battled every day in practice. Q: Do you recall any specific guys would call another out a lot? CS: I really can’t. I just remember it happening. Maybe Ramaekers or someone like that. I can definitely see him or someone like that, he sticks out. (laughs) And we just did a radio show together for Jerry Murtaugh’s Legends Radio Show. That was pretty cool talking to him again.